Here we have on sale The Windsor Chesterfield Range 3 Piece Suite. 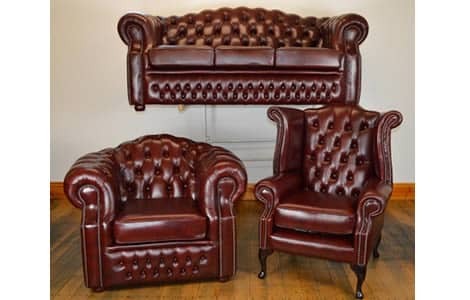 Consisting of 3 Seat Sofa, Club Chair and Queen Anne Chair. Finished in Superior Old English Burgundy leather. Ready for dispatch at the earliest opportunity. The Windsor Chesterfield with its slightly sloping cut back arm retains the unmistakable classic leather Chesterfield design and is an asset to any home.